India’s approval process for genetically-modified (GM) crops is so tight and politically rigged against trait developers and farmers that it is exposing the country’s agriculture and environment to the very risks it is meant to prevent. Denied technology through legitimate channels, farmers have turned to illegitimate ones. In September, Delhi-based South Asia Biotechnology Centre (SABC), an advocacy for GM crops, made a representation to the Genetic Engineering Appraisal Committee (GEAC), the apex regulator for agri-biotechnology, about “rampant” cultivation of cotton resistant to glyphosate. This is an off-patent herbicide which Monsanto sells as Roundup and India’s Excel Industries as Glycel. That herbicide-tolerant (HT) cotton is grown extensively is well-known in farming circles. 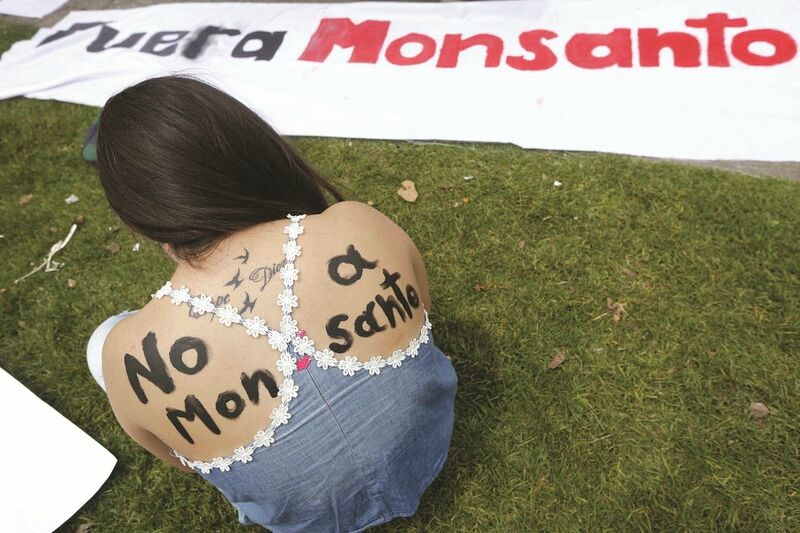 Anti-GM activists have blamed Monsanto for it because its associate company, Mahyco, was seeking approval for Roundup Ready Flex, which is bollworm-resistant cotton with the HT trait. Monsanto has denied the charge. In a press release, it said it has been bringing this practice to the notice of GEAC since 2008 and its last such intimation was in August this year. What made headlines was the extent of the practice. SABC said 35 lakh packets of 450 grams each of HT cottonseed were sold this year in central and southern India between Rs 1,200 and Rs 1,500. This, when Bt cotton’s marked price was Rs 800 a packet. It said this was a dramatic increase from 13 lakh packets last year and eight lakh packets the year before. SABC’s Bhagirath Chowdhary explained that hybrid seed production takes time, hence the surge this year. Even if it is assumed that the volume is an over-estimate, and the price farmers paid was, say, an average of Rs 900 a pack, it is still a sizeable business. 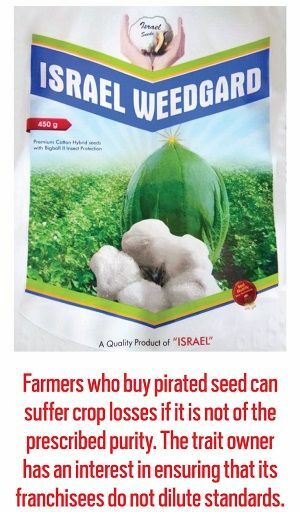 M Ramasami, chairman of Salem-based Rasi Seeds and also of the year-old Federation of Seed Industry of India (FSII), said if SABC’s figures are correct, then the “pirates” would have eight percent of the cottonseed market share by volume. There is rapid progression from that threshold and volumes could double next year, he said. He and other members of the association met the environment minister and officials, demanding action against cultivation of HT cotton. But there is little that the environment ministry can do. It cannot put the paste back into the tube. The chairperson of GEAC, Amita Prasad (now transferred to another ministry), said advisories would be sent to states to take action. The states lobbed the ball into the centre’s court. Maharashtra Principal Secretary Bijay Kumar said: “We expect GEAC to guide us instead of skirting responsibility.” The Director of Nagpur’s Central Institute of Cotton Research (CICR), VN Waghmare, said: “Whosoever is cultivating it, is indulging in an illegal activity. Bio-safety procedures have to be followed.” He added that he was new to his post and could not comment on the Institute’s report of February, which SABC had appended to its representation. CICR found six of nine hybrids testing positive for herbicide tolerance. Two of the brands were of a well-known company. Anti-GM activists have blamed Monsanto for HT cotton because its associate, Mahyco, sought approval for Roundup Ready Flex, bollworm-resistant cotton. “I am hearing it is being grown here and there. But we need a report. The decision should be taken by the government of India. We do not have any role to play in the state government,” said T Keshavulu, director, Telangana State Seed Certification Agency. When told that the state’s own laboratory had found a Bt cotton brand called Kamadhenu testing positive for herbicide tolerance, he said he “did not know how they are doing it because there are no protocols for testing” as the trait is not approved for sale in India. Glossing over the illegality, the Andhra government on October 5 notified a three-member committee to study the “efficacy” of illegitimate HT cotton and give a report within 15 days. The notification was issued on the basis of a representation from farmers who said HT cotton was being grown in half of Andhra’s cotton-growing villages and 15 percent of its cotton area was under the illegal hybrids. News agency Reuters reported that the notification was withdrawn on October 13. On October 17, the Andhra government notified another committee of three officials to investigate the illegality of HT cotton cultivation and give a report within 15 days. It said action be taken under the Environment Protection Act and even criminal action would be taken against those who violated the law. 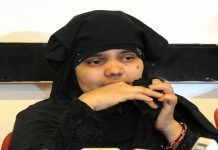 The behaviour of the centre and the states, particularly Andhra, shows that they have scant regard for the rule of law. They should have cracked down when the problem was nascent. Now that there is extensive cultivation of illegitimate HT cotton, governments are scared of taking on the farmers. The government has no legitimate alternative to offer. Mahyco withdrew its application from the GEAC for approval of insect-resistant HT cotton in August last year. Its hybrid with Bollgard II Roundup Ready Flex (RRF) technology had completed bio-safety trials and was ready for approval. When GEAC’s Prasad asked Mahyco’s Raju Barwale why it had withdrawn the application, he said it was not viable. In 2015, the government reduced the trait fee payable to franchisors like Mahyco-Monsanto Biotech (MMB) by 74 percent to Rs 43 per packet without taxes. The agriculture ministry tried—unsuccessfully—to undermine patents granted to agri-biotechnology traits using the Essential Commodities Act. The Delhi High Court has upheld patents on GM traits but has said the government can fix the value. Trait owners chafe at this truncated right. A section of the seed industry led by MMB’s former franchisee, Nuziveedu Seeds, is aggressively pushing for GM seeds to be patented under the Protection of Plant Varieties and Farmers’ Rights (PPVFR) Act. It has the support of the agriculture ministry. Mahyco feared that if Bollgard II RRF was approved for largescale cultivation, seed companies like Nuziveedu would incorporate the trait into their hybrids and tie it up in litigation. Curiously, the farmers who made the representation to the Andhra government said patents are not applicable to plants and seeds. They wanted organised seed companies to produce HT cottonseed so they would be assured of quality seed. They seemed to be acting at the behest of some seed companies. Ramasami says farmers who buy pirated seed can suffer crop losses if it is not of the prescribed purity. Weeds and bollworms can also develop resistance to the technology, rendering it ineffective. Technology stewardship is important for delaying resistance. The trait owner has an interest in ensuring that its franchisees do not dilute standards. But if the rights flowing from ownership are denied or attenuated, bad seeds will ride the market along with good ones. Farmers have little alternative to HT seed. A national sample survey of 2014 found that labour costs had the second highest share in average cost of production, next only to fertiliser. Manual weeding is not only expensive. Under pressure from anti-GM activists, successive governments have blocked approval of new GM crops. Ministers behave like monarchs, overruling the opinion of scientific bodies like the Indian Council of Agricultural Research, the National Academy of Agricultural Sciences and GEAC. Bt cotton, which is the only GM crop approved for cultivation in India, first came in as a pirated version. In 2001, when GEAC ordered the crop destroyed in Gujarat, the then chief minister, Narendra Modi, resisted. Now illegitimate HT cotton is being cultivated. There are reports that Bt brinjal is being grown in areas bordering Bangladesh. An executive of an agri-biotechnology MNC (not Monsanto) said he had seen it grown in Gorakhpur and along the Ahmedabad-Gandhinagar highway. Ramasami believes GM corn might enter the country through Pakistan, which has approved it. This may well happen to GM mustard, whose approval for largescale cultivation GEAC recommended in May. Seed production should have started this winter season but Environment Minister Harsh Vardhan has not taken any action. This is how governments frustrate scientists, waste public and private money and drive farmers to illegality.